2 by 3 Heroes: Making me smile. I don't really need to say any more than that. I am sure, for the great majority, we have a job we tolerate at least have the time. Or less. Maybe we really liked it when we first started, or there are still times in the workday where the job isn't too bad. Hey - I still have them. But for a fair amount, it's work. It's not a lot of fun, but it pays the bills (ie buys the cards). Most times, we cannot live out our childhood dreams as a ball player, fireman, astronaut and/or submarine driver. I'm called a helmsman or a pilot, you idiot. There are those that tell you to work a job you love - then you will never work a day in your life. It completely makes sense. But even though I am coming up on 50, my dream job is still as a ball player, fireman, astronaut or submarine driver helmsman. Dream job #5 - designing calendars. For you that have not been around, or may have forgotten, I am fortunate enough to work from home 4 days a week. Sure, there is a lot to love in that, like avoiding my almost 100 mile round trip commute in Chicago rush hour, the gas, the tolls, the wear and tear on the car, the lost hours behind the wheel....I'll stop there. However, when you are cut off from work, when you seek assistance from anyone above you, it's a daunting task. You send a chat message.....and wait. Then usually wait some more. And a little more wait. Now, Friday was a pretty rough day at work. System issues, cranky customers, the cold temperature. Yet, my office is in the front of my house and I can see my mailbox out the window. Since blogging, going to the mailbox is a definite reason to love my job. Many of you do not disappoint, so I usually get a nice uplift for work when I pull out an envelope or two from my mailbox and it's filled with cards. Now, all these I am showing are not from Friday, but they have all made my past couple weeks very enjoyable at about 11:30am. Jeff from One Man's Junk Wax dropped two PWEs on me over a couple days last week. 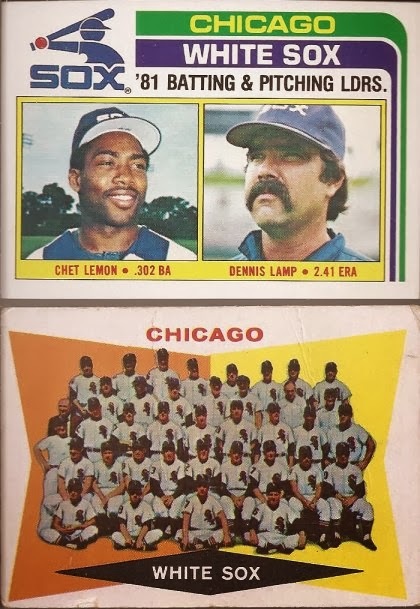 How about tons of '78, '79 & '80 Chisox vintage? All so very needed to fill team sets. Thanks a ton, Jeff. AJ at The Lost Collector sent a PWE to me last week as well. 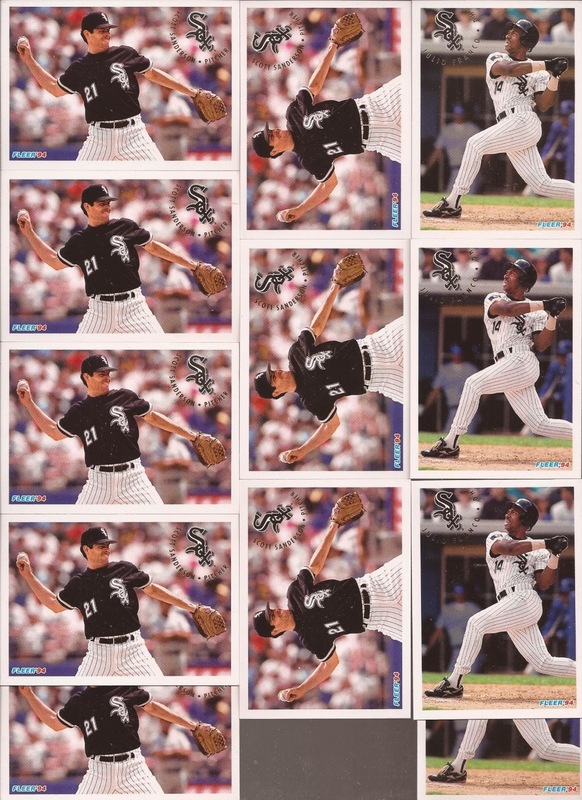 I love those Ovation, but never had a single card with a White Sox on it. Textured cards make me smile. 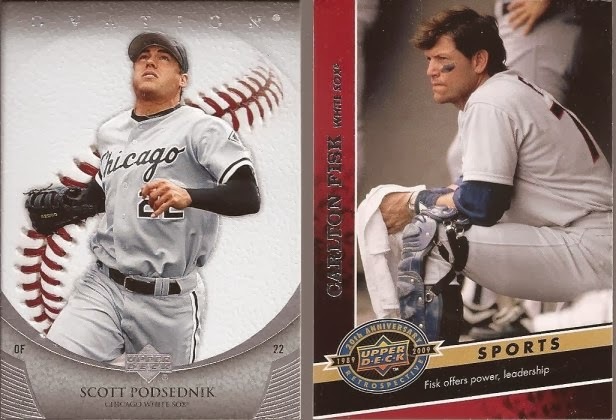 Plus, who doesn't want/need more cardboard with Fisk on it. Especially when it's a card missing from your collection. Thanks AJ! Chris and Kyle from Old Foul Cardboard dropped their usual bimonthly or so envelope on me. While I'll drop them PWEs every other week, they like to stockpile cards and then really hit me with something nice. I'm thinking I need to start a Sale PC. So here's a good start. Here's why they mail me once every other month. Needless to say, anything Blackhawks in my area is over priced. 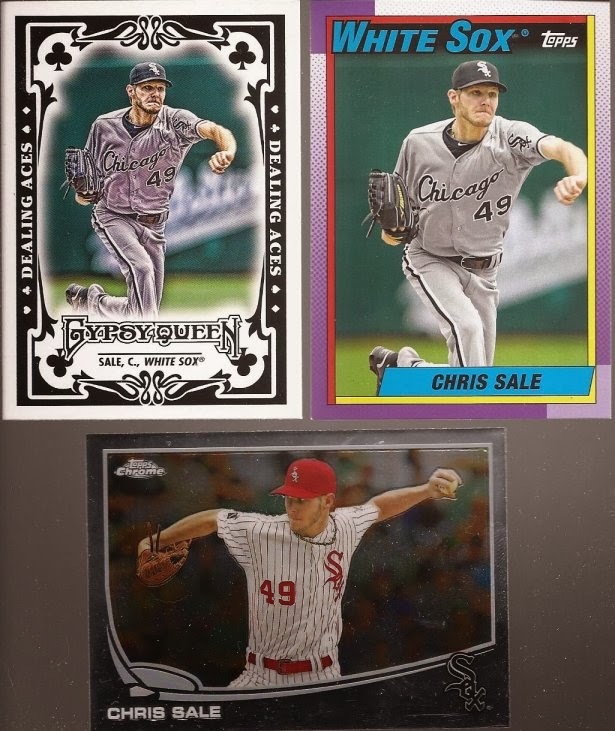 But they (and by they, I mean Kyle) have the ability to find great cards, then snag them cheap. 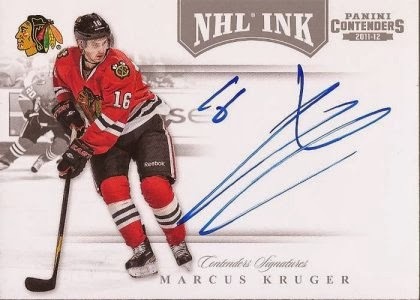 No way I would pass an on card auto of Marcus Kruger. Kruger is making fans forget who used to wear 16. Thanks as always, guys. And the envelope that reminded me of how much I love working from home came from TJ, everyone's favorite Junior Junkie. Lots of great White Sox cards like these vintage. Tons of shiny cards. 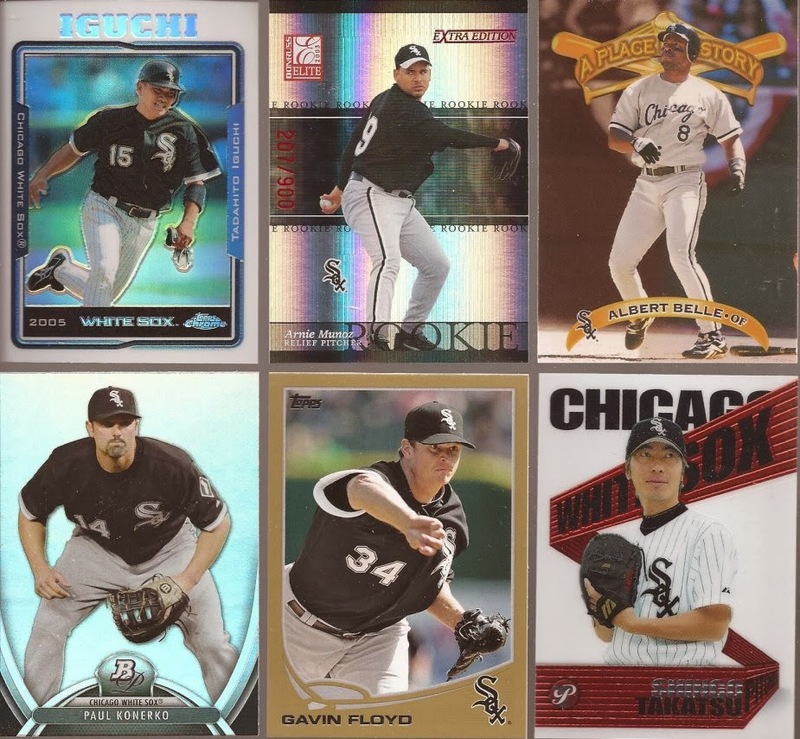 The Iguchi is needed for my Tadahito PC. The Belle isn't shiny so much as really really glossy. So yeah - shiny. Just doesn't show in the scan. TJ also apologized for a light Bipping. But he failed to put a single Roberts card in the pack. As I dug thru the 30+ or so cards, I realized why he apologized. More like a Scott'ing and a Julio'ing, but neither trip over the tongue with grace, so we'll call it a Bipping. One thing the Junior Junkie seems to enjoy doing is really wowing a package. 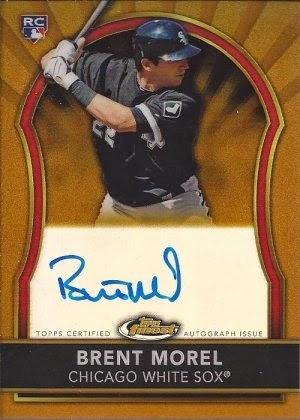 I am fairly certain, though I could be wrong, that there is no unresolved trade TJ needed to make up for, so a nice Morel auto is a pleasant surprise to pull. I owe you, TJ. Little over 48 hours until I'm back on the phones. I hope there's mail for me on Monday. It's really easy to just day dream about being a calendar designer for a living. I like your #5. That SI cover is more than I need....or could handle for that matter.